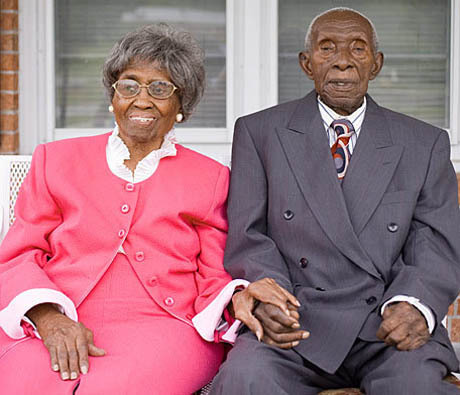 Meet Herbert and Zelmyra Fisher of North Carolina. They have been married 85 years (86 in May) and hold the Guinness World Record for the longest marriage of a living couple and get this…. Zelmyra is 101 years old and Herbert is 104. The happily married couple teamed up with twitter this Valentine’s Day to answer some relationship questions. Check out their take on finding love, getting through hard times and more. Good read. Zelmyra: A hard worker & good provider.The 1920s were hard,but Herbert wanted & provided the best for us.I married a good man! Zelmyra: I cook dinner EVERY day.Herbert left work early & surprised me – he cooked dinner for me! He is a VERY good cook! Herbert: I said that I was going to cook dinner for her & she could relax – the look on her face & clean plate made my day! 8. You got married very young – how did u both manage to grow as individuals yet not grow apart as a couple? NEVER physically! Agree that it’s okay to disagree, & fight for what really matters. Learn to bend – not break! We are both Christians & believe in God.Marriage is a commitment to the Lord.We pray with & for each other every day. Need we say more? Jesus is the center of a great marriage. When we surrender our marriage to Him, we’ll surely be in good hands. Previous postWhy God insists on rejoicing?